Fire Safety training is a must for all organisations. Protect your staff, your premises and your business with some simple lessons learned through our excellent training. This half day Fire Safety Training course includes hands-on use of fire extinguishers, no previous experience is necessary. This course will help employers comply with fire safety legislature. 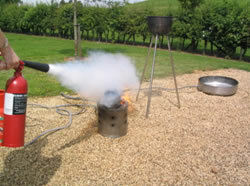 Our live fire extinguisher training sessions are held in a controlled environment. We generally use water and carbon dioxide extinguishers, although dry powder, foam, or wet chemical extinguishers can be demonstrated if required. We also demonstrate the use of fire blankets, if appropriate. Our practical sessions we use proprietary gas fire simulators (these are clean burning and don’t damage the floor surface or cause a smoke problem). The benefits of practical fire extinguisher training cannot be overstated. The confidence gained from being trained by our instructors will produce great results and may lead to a small fire being nipped in the bud, before it spreads or develops.